Image: Macall B. Polay/Courtesy of HBO. It's been a long year for Game of Thrones fans: season seven wrapped in August 2017, and season eight isn't slated to begin until April 2019. As such, many are chomping at the bit to know exactly what happens in Westeros and beyond the wall. Well, good news GoT fans: Nikolaj Coster-Waldau — known as Jaime "The Kingslayer" Lannister on the show — is talking, and boy does he have a lot to say. In fact, in a new interview with HuffPost, the actor confirmed his character is indeed heading north. Of course, when season seven ended, it appeared the Kingslayer may be headed toward the wall. After finally standing up to his sister, Cersei, Jaime rode off in an unknown direction, but his latest interview confirmed what fans have been speculating. 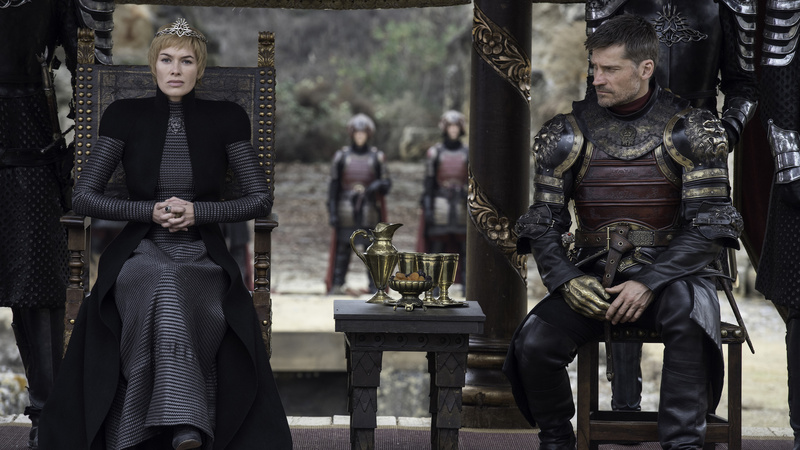 When asked about Jaime's intentions, Coster-Waldau stated that he and Cersei are playing two "very different games…Cersei’s playing the game of thrones and Jaime’s playing the honest game of survival, and trying to accommodate both his sister and his brother. "Does this mean a character shift is in the cards for Jaime? Maybe. At the end of season seven, Cersei revealed that she had no intention to help Jon Snow or Daenerys in the war against the undead — which is what prompted Jaime to leave — so it seems like he may join #TeamDragons and (of course) his beloved Brienne. As for Brienne, when asked about his relationship with the Starks' bodyguard/warrior/all-around badass, Coster-Waldau remained tight-lipped: "I don’t, well, I know how it ends but… I can’t comment on that." Game of Thrones will return in the spring of 2019.